OMO stands for Oblivion Mod Organizer because it was originally developed for Oblivion but it now works with Fallout 3 and Fallout NV too. OMO is a new mod manager with several unique features that make it particularly ease to try out new mods and to easily get rid of those you don't like. It also lets you create mod-profiles so you can have multiple playthroughs in parallel with different mods active. Here is how it works: OMO uses an additional directory called "mods" (Fallout 3/NV: the directory is called "omo_mods" because "mods" is already used by fomm). When the game is called using the launcher or a link created from omo, selected directories below mods/omo_mods will be treated as if their content resided in the data directory. That means instead of putting mods into the data directory, potentially overwriting files from other mods, you can keep them cleanly seperated. Now you can simply delete a single directory to get rid of a whole mod without affecting any other mod. OR you can disable a mod from the gui for the same effect. In cases where multiple mods provide files of the same name, omo lets you define which mods have priority and if it doesn't work properly, you can easily change priority via drag-and-drop. No more copying/moving files around. The one tool I know will not work is wyre bash. If you try other tools, successfully or unsucessfully, please drop me a line. - plays nice with most 3rd party tools. - OMO allows installation order management for any mod installed through it while FOMM only does that for fomods and I believe it's easier in OMO. OBMM provides no installation order management at all. - OMO is, to my knowledge, the only tool that lets you switch to a completely different mod-setup with a single click and without the need for multiple Game installations. - OBMM/FOMM uses a database to keep track of which files belong to which fomod and this database can get confused. Assume you install a fomod with the file abcd.dds and afterwards you manually install a mod with the same file, overwriting it. Mod Manager will still think the file belongs to the fomod and during de-installation of the (f)omod removes that file, breaking the manual install too. This problem doesn't exist with OMO, each mod has its own folder thus the affiliation of a file is clear. - OMO is under active development and I'd be happy to hear your feature request. If you need these features, you can easily use OBMM/FOMM alongside OMO and have the best from both worlds. Unpack the archive to your Game folder or any directory below that. To use omo with steam we have to use a workaround. This requires obse, so if you don't have it yet, install it now. Omo is NOT an obse-plugin, it only uses their injection mechanism. Please report any problems with this to me and NOT to the obse devs! Please also note that with this workaround you can not install obse plugins via omo, they HAVE to reside in the actual Data-Directory. There should be no special steps to update from an earlier version of omo to 0.4, just overwrite all files from the archive. You can use the smaller archive without Qt since those files are the same. If you want, you can now move omo to its own directory below the game directory. 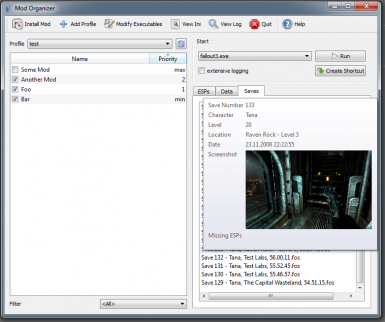 Move all the files listed in the installation-section, as well as omo.ini, the profiles-directory and the mods-directory (called omo-mods in fallout). The gui of omo contains a rather complete help-system. If there is anything unclear, please contact me. New mods (.7z, .zip or .fomod) can be installed from regular archives directly from the omo gui or manually. After that, the mod will be visible in the gui (you need to restart omo if it was running). OMO also contains a small hack for installing scripted omods/fomods through the Mod Manager. If you start OBMM/FOMM through OMO and install an archive, a Dialog will pop up to ask you if you want to place files in a directory below "mods"/"omo_mods" instead. In the omo gui, you can use drag&drop on the left pane to change the installation order of mods. In case of a file-conflict between two mods, the file from the mod higher up in the list is used. In the lower right, there are two tabs. One ("data") gives you an overview of the data directory as it is presented to the game. This will also show which mod a file is used from, so you can see how conflicts are resolved. In the other tab, you see only the list of esps and esms and you can use drag&drop to change their load order. If you don't start the game (or the "Mod Manager" or any other mod-management tool) through omo, they will not be able to see your mods. Therefore please remember to always start through omo. Should you accidentally start your game without omo, it is possible the game will crash because it is missing files files. If you want to contact me, for example to report a bug, please send an eMail to sherb at gmx.net. If you attach a log file (which usually is a good idea) please compress it. - 0.3: Performance improvement, Load Order Management, Data Directory management, Mod Installation through the gui. Support for Fallout 3 and Fallout NV.